Persepolis is very old. Well, the one in Iran is ancient, but even Persepolis Mark II has a bit of history attached. It’s been open in its current incarnation for eleven years this Sunday (Happy Birthday to us etc. ), but the premises has been trading as a shop since round about 1850. And it has nearly always been a sweetie shop, which makes it kind of cool that we are carrying on the tradition in some small way. The wonderful Caroline of Caroline’s Miscellany actually spotted a ghost sign we hadn’t even noticed proudly proclaiming us to be CONFECTIONERS. So there you go. But we were really excited about the latest photo to come to life (above). Seems number 30, Peckham High Street was a record shop in 1932, when the above image was shot, thus proving that we’ve also always been Rock and Roll. What were they listening to then? Well, the chap advertised was one Jack Hylton, who wrote ‘You’re the Cream in My Coffee’ and this jolly little ditty. 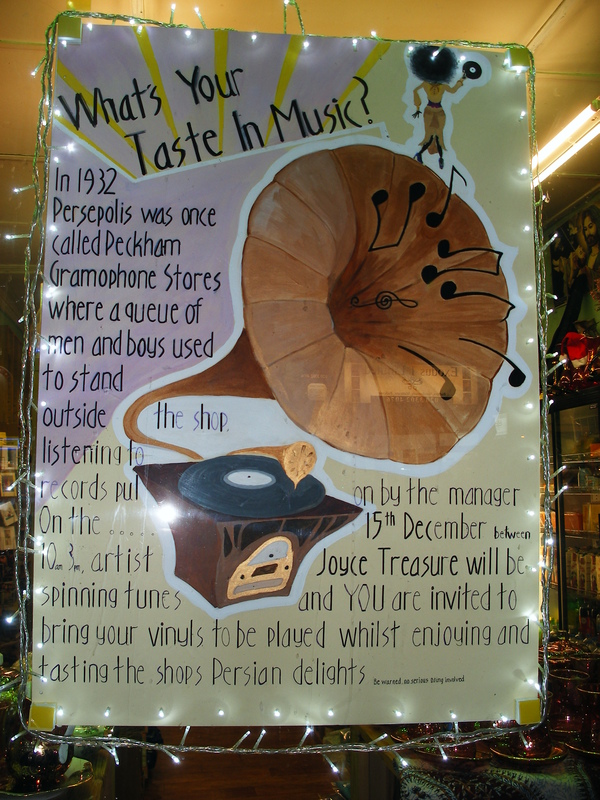 To celebrate a bit of Peckham history, a lot of music history, and the wonderful potential that is a shop window, artist Joyce Treasure has replicated some modern Persian album covers and is spinning a few discs here on Saturday 15th December. You are invited to bring along your favourite music on vinyl, sip a cup of fragrant tea from our samovar, and chill while you shop. This is all part of I Art Peckham Shops, a collaboration between Peckham’s shopkeepers and its artists. The art installations can be seen between now and 6th January (just in case you needed any further encouragement to visit Peckham). 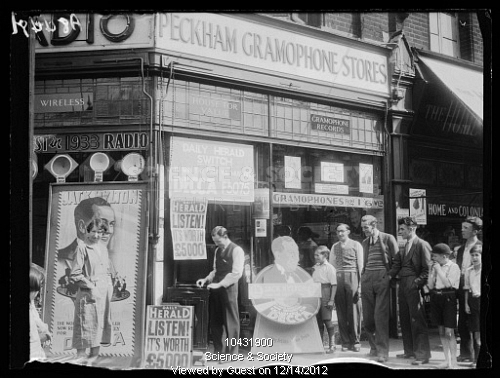 I’m sorry, but according to John Beasley the Peckham Gramophone Stores was at 141 Peckham High Street, between the High Street post office and Marmont Road. I am not aware of how he knew this, probably a street directory at the Local History Library.